Trio Grab is a Trio Move featured in Mario & Luigi: Paper Jam. It is the third Trio Move to be introduced, and is first learned in the Twinsy Tropics Dungeon. It can be used mainly to grab objects from a distance as well as to activate bridges. 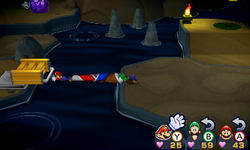 During the events of the game, Mario, Luigi, and Paper Mario are captured in Doop Doop Dunes and taken to the Twinsy Tropics Dungeon. During exploration of the dungeon, they encounter a large door which can only be unlocked with a key. The key is conveniently located a bit to the right, though it can only be reached by crossing a questionably sturdy bridge. As expected, when the trio attempts to cross it, the bridge collapses and the trio are sent plummeting. Fortunately, Mario, Luigi, and Paper Mario are able to scale back up, giving Luigi the idea for a new Trio Move. They then use this tactic to reach the key, which is on the other side, and insert it into the door, allowing them to progress further through the dungeon. When the Trio Grab is first learned, it can be used for the remainder of the game. This move is especially helpful when grabbing objects out of the trio's reach, activate bridges, and reach new areas by latching onto poles across large gaps. Trio Grab can first be activated once the button is pressed twice. Then the player must quickly press , , and respectively to form the trio into a stack. The player can then press to grab items, open bridges, and reach different areas. To exit Trio Grab, the player must press or to return the trio to normal. After the Trio Grab is learned, it can be activated at any time during exploration by pressing the icon twice, or by simply touching the icon shown on the bottom screen. The Trio Grab can be practiced at any time in the "World" section of the guide. This page was last edited on April 4, 2019, at 20:15.